Just when I thought something as simple as washing the dishes was a job way too intense for a 16 year old boy to handle, Shawn decided to dedicate himself to teaching the dog tricks. At first he tried to tell me he taught Bingo how to shake, but he forgot that I taught him that trick myself quite some time ago.Suddenly it made a lot of sense to Shawn on why Bingo was so quick to catch on. Bingo thought this trick was very easy to learn, since he already knew it. 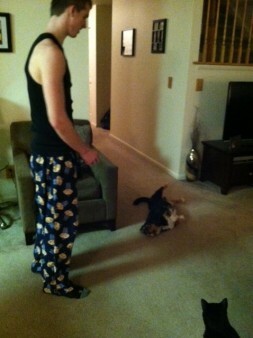 So Shawn decided to teach the dog a trick for real. He decided the “Bang, you’re dead!” trick would be neat one. After about ten minutes, Bingo started to catch on. The next day, he forgot it all. But after a few days of repetition, he pretty much nailed it. That is, as best as Bingo is able to lay down and pretend he is dead. Clearly, he hasn’t mastered it (though he thinks he has). Bingo doesn’t have much self control, but he sure tries. 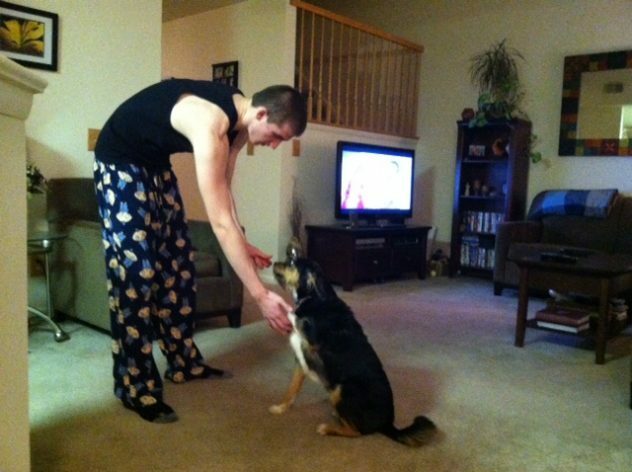 To review some of the benefits of teaching your dog tricks, read up on it here.Happy training!